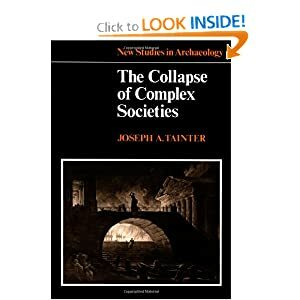 I had recently come across Joseph Tainter’s Collapse of Complex Societies. As the title suggests, the book explores how past civilizations (and ours?) were unable to cope with certain pressures of their environment and collapsed. The book qualifies the term “collapse” – in Tainter’s view, collapse is a justifiable choice when a society is unable to solve the various problems with greater complexity in their socio-political configurations. Investment in sociopolitical complexity as a problem solving response often reaches a point of declining marginal returns. Collapse then, is the reduction of sociopolitical complexity. This is manifested in the breakdown of a central administrative authority. Collapse can only occur in the absence of a political vacuum. Hence, the book describes the case of the collapse of the Western Roman Empire, and not the Eastern Roman Empire, which would have caused the expansion of peer empires in the immediate region. and several others. The only way out of this is to seek energy subsidies – to seek a new source of energy that is abundant, and therefore, cheap. Overall, whether or not the whole world is on the verge of collapse is difficult to say. An individual country can no longer collapse because of the inter-linkages between countries. The collapse of one country these days typically results in an intervention by the global community of some sort, either through a UN mission, or by a group of countries. There is another way out of collapse. Collapse can be put off by the discovery of new resources. On Earth, the production of minerals and energy could soon be entering a phase of declining returns, and the only other way left seems to be the prospect of mining asteroids in space. There is also a darker side to this discussion about collapse, and that is collapse might not be such a bad thing. Collapse occurs when the cost of sustaining otherwise complex socio-political arrangements becomes difficult in the face of stresses. Collapse is an option, and an entirely valid and rational option to boot. The natural question to ask is: how can we stave off collapse? The nation-state could be an optimum arrangement when the people are fairly homogenous and when they share similar values and history. In this respect, nationalism becomes an entirely rational course of action. To reduce transaction costs between the people and the state, there should be congruence in the values and perception of the nation in the first place. Energy (both physical and administrative) would then not be needlessly expended trying to get the values of people in line with the state for every administrative action. Yet there are sub-state actors as well. Beneath the state, there can be regional bodies with the attendant departments. Cities can be broken down into districts, and districts into sub-districts and zones and sub-zones and finally into neighborhoods. From this perspective, socio-political organization can be thought of as being fractal in nature; self-similar at every level of abstraction, but not quite the same. An appropriate imagery would be the branches of a tree. When socio-political collapse happens, the break down need not be total chaos – autonomy and allocative decisions devolve down the hierarchy. This also means a prior allocation of administrative resources to levels of authority below the hierarchy. At some point, some of these resources might be thought of as wasteful, but in the management of a crisis, power needs to be vested in the lower levels of hierarchy before higher levels of authority can take stock and take charge of the situation. The sharp reader will note another conundrum here. In times of crises, the devolution of power might be useful, but in normal operating conditions, the investment of power in lower levels of hierarchy can be threatening to the higher levels of hierarchy. Hence separatist movements can happen, as with civil wars, when high levels of autonomy can be granted to regions. This issue depends on the relative levels of power between the central administration and the regional administration. The balance of power between the various sub-national polities is likely to be the result of historical trajectories. There is no clear answer. Singapore, as with all countries, will have to find their own solutions.